IN the past, it seems like some people have been able to get it done. I believe Graham Rahal's PTS Riviera Blue 981 had the interior package painted and I think there was a PTS car in ? Wisconsin posted either here or Planet 9 with interior package painted also. Protocol, Eduardo? Directly through Porsche Exclusive? Yes, it has been done. 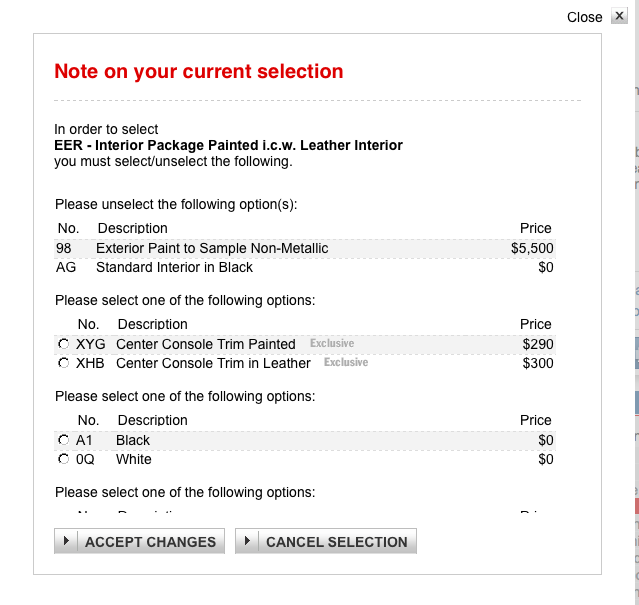 I just think the Configurator can't handle 'PTS' very well due to faulty or incomplete programming. But it you decide on PTS, you or your dealer needs to talk directly with one of the two US representatives of 'Porsche Exclusive' (Sascha or Melissa) to make sure you get all the options (e.g. EER) correctly on your order. For a while, I thought there was a problem with getting the door trim painted w. EER. 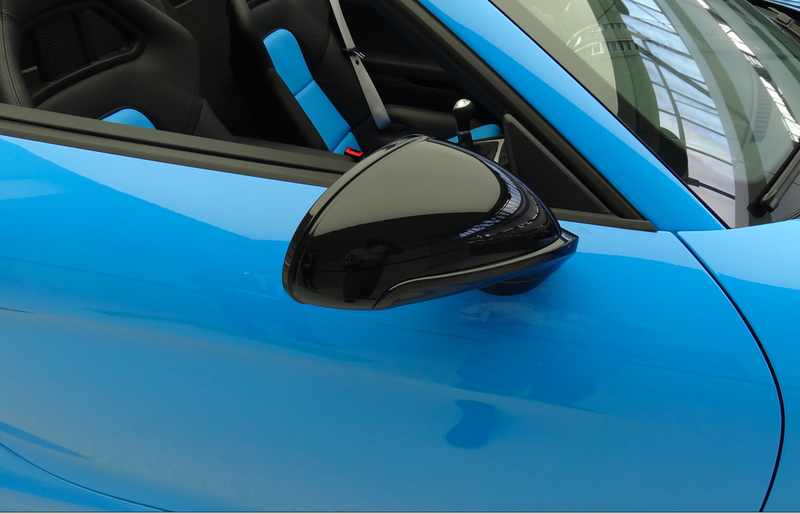 You see it missing in photo #2 on this 991 cabrio. 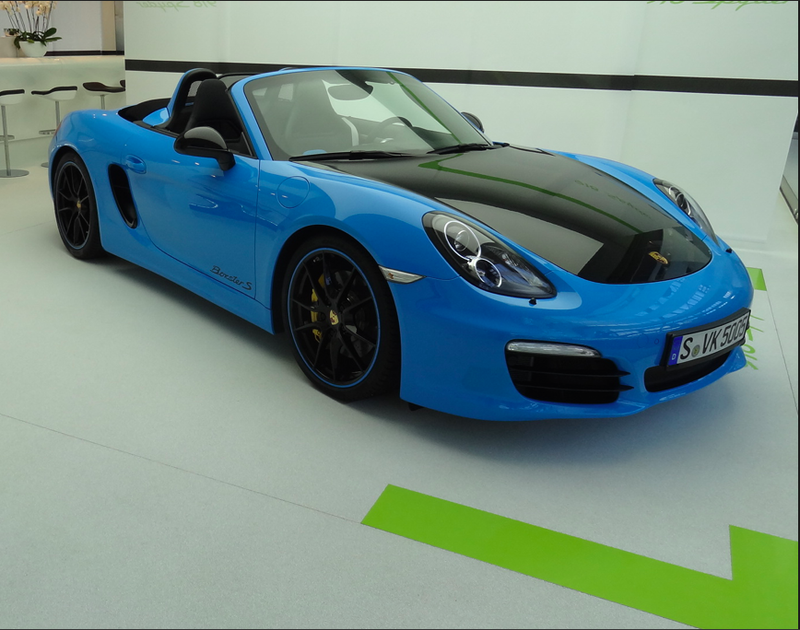 The color-coordinated door trim was also missing from Rahal's 981 'Riviera Blue' Boxster & slc's 'Mexico Blue' Boxster (photo #3). But apparently it can be done so that all basic interior pieces - under dash trim plus door trim - are painted with exterior body color via EER! 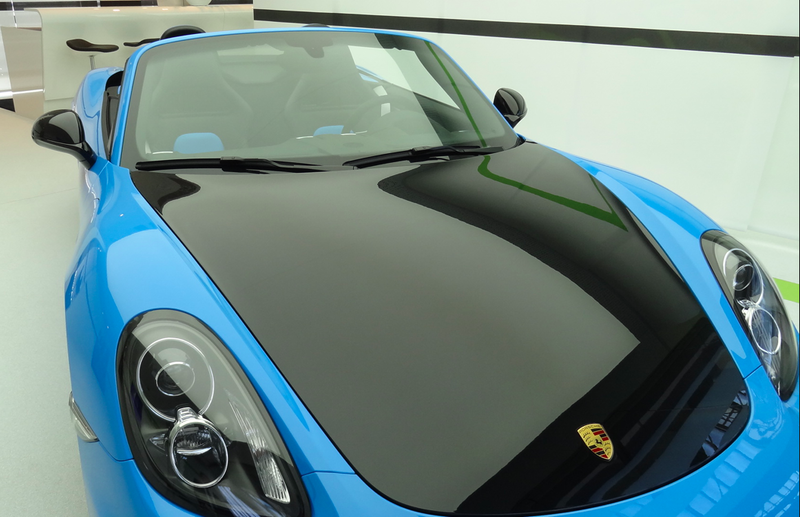 You can see it done in photo #4 on the 981 Boxster in 'Aqua Blue Metallic'. I took photos #2 & #4 at the 'Porsche Exclusive' department next to the European Delivery area in Zuffenhausen one year ago! So EER can be done in one of two ways with PTS. You just need to talk to 'Porsche Exclusive' and/or an experienced US dealer in PTS to make sure it's done according to your wishes re: your order! Carmine cayman s with black sport techno wheels....all set! Man, I love that green Eduardo! Ian, normally I am not 'green'! Only on St. Patrick's Day! But getting back to topic, what 'green' are you referring to? We have been talking 'Porsche Racing Green', 'British Racing Green', 'Dark Olive Metallic'. 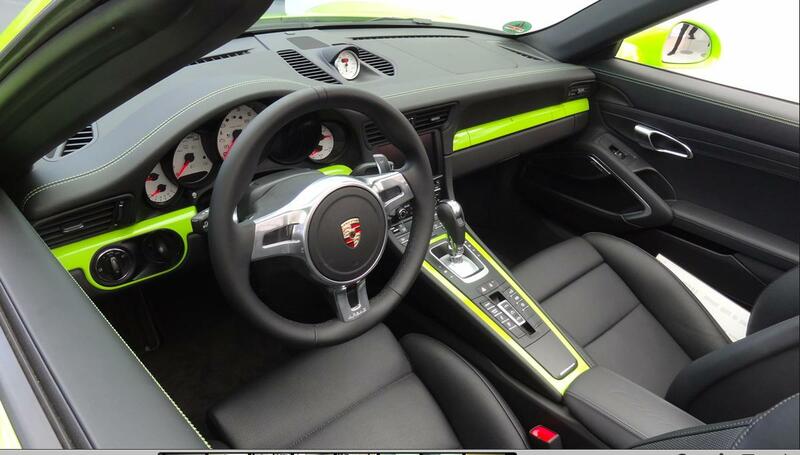 And lastly the interior trim on that stunning PTS 'Lichtgrün/Birch Green' 991 Cabriolet! Birch green interior trim! I love olive too, but not metallic, please. Ok. Here is more...of the same cabriolet! The lens caught too much color saturation on the first two shots. The actual color as seen by the naked eye is closer to the one on the sample shown in Photo #3. 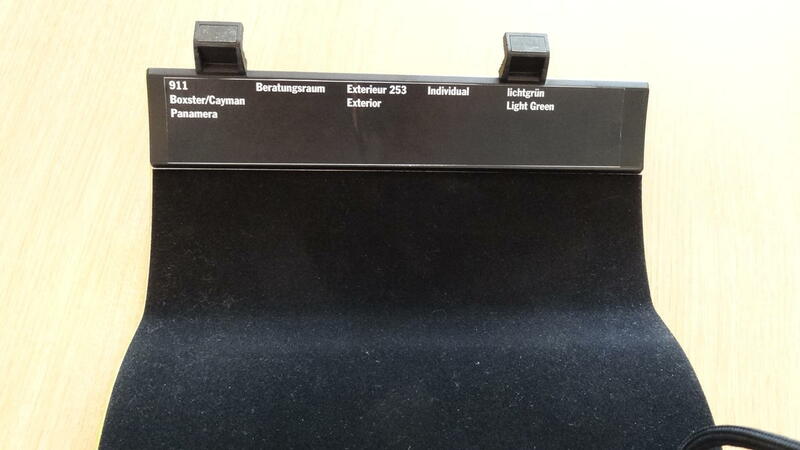 Photos taken last year on my last trip to Zuffenhausen. 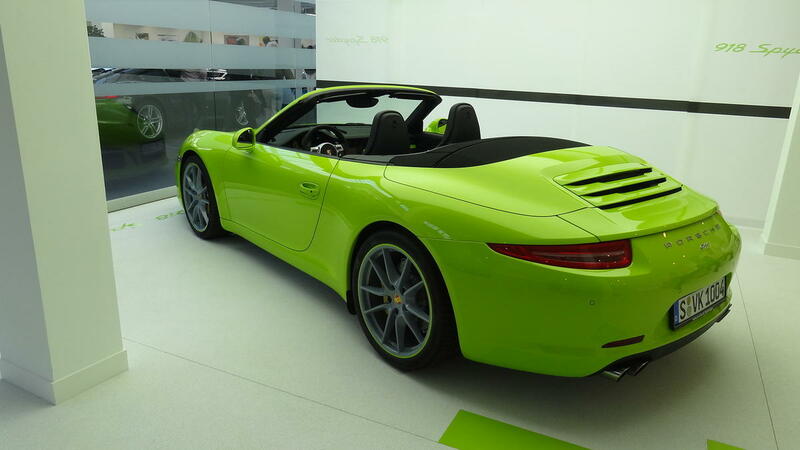 The 991 Cabriolet below was eventually sold by PAG to a French P-dealer for one of their customers. Someone needs to order a Cayman* or Boxster in this PTS color! By the way, Porsche admitted to me that the correct English name for this old Porsche color is 'Birch Green', not 'Light Green'. *If PTS is finally available in MY2015 for this model! Special Options Available from 'Porsche Exclusive'...but rarely seen! 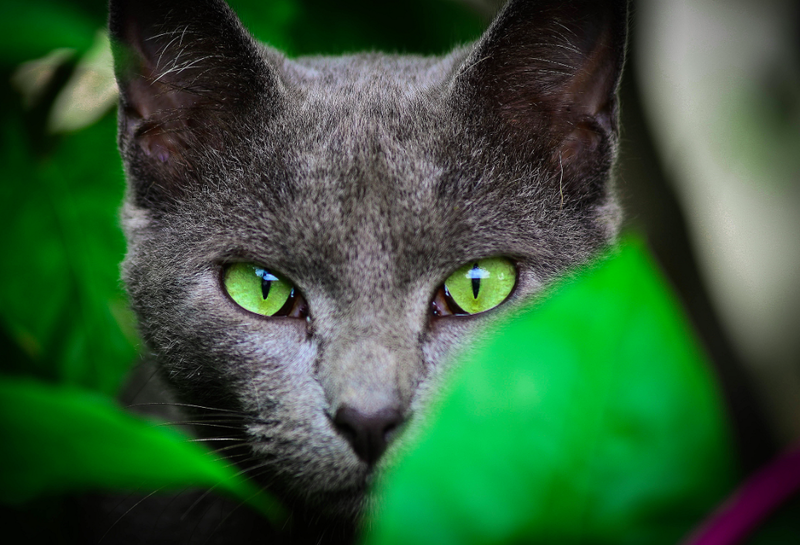 I want to thank our Moderators for placing this thread at this prominent high visibility location, where it will be easier for all forum members to access the information & also contribute to it! 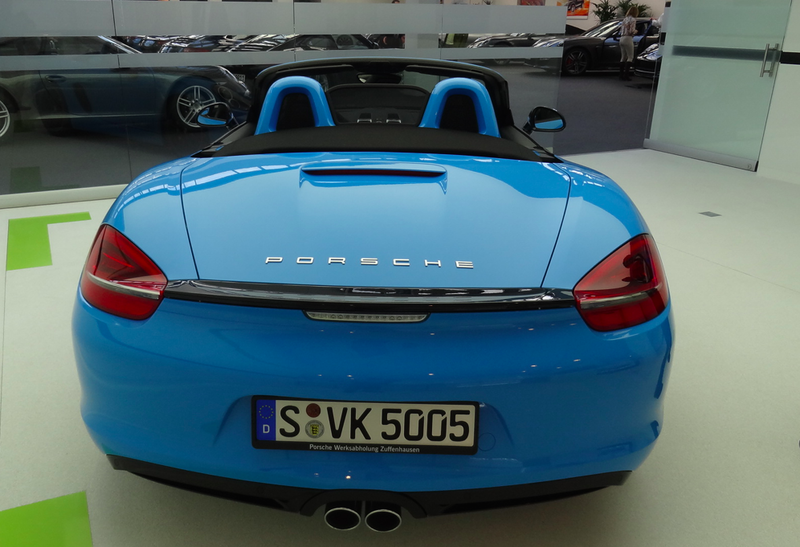 I have not discussed in detail a particular 981 Boxster which I photographed in Zuffenhausen on my last trip there last year. It's done in PTS 'Riviera Blue'. But what its novel about it are the gloss 'Black' painted exterior pieces, including the entire front hood! 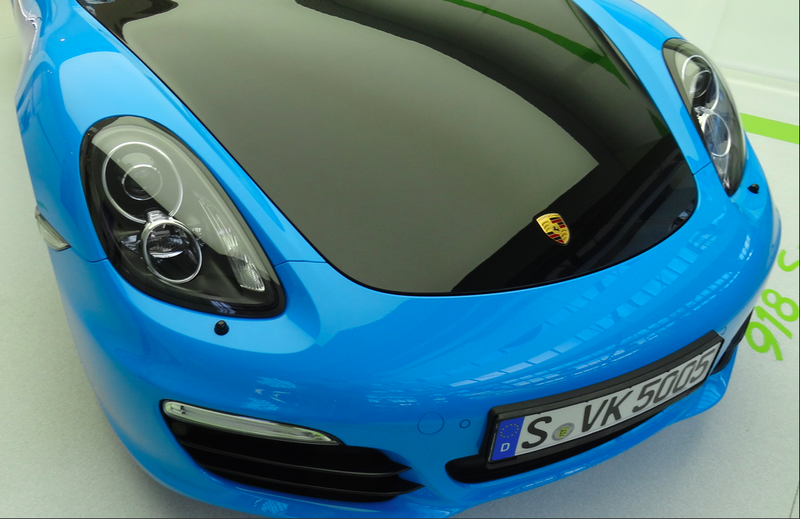 This dual tone exterior paint treatment apparently has been available from 'Porsche Exclusive' for a while, but it probably has been rarely ordered since FEW know it can be requested & done this way! You also need to be willing to pay for the extra cost! 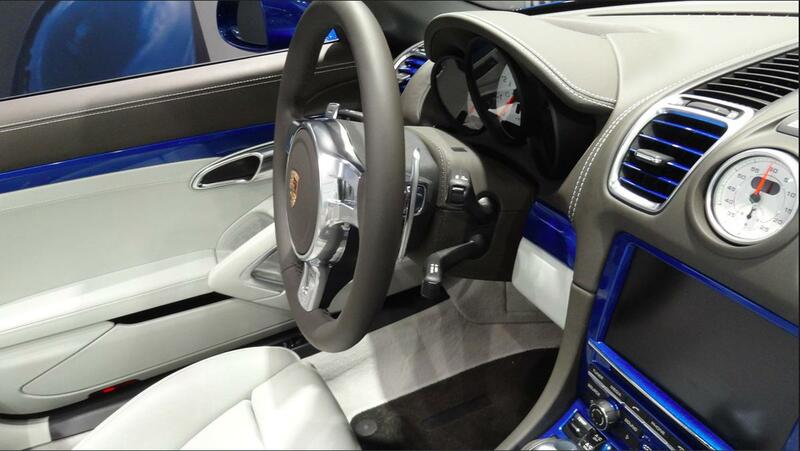 These are mostly options that don't appear in configurators or in Porsche's marketing brochures. In general, dealers are not even aware they exist. But it shows that you can do a lot of creative customizing via 'Porsche Exclusive' if you explore its full range of capabilities! 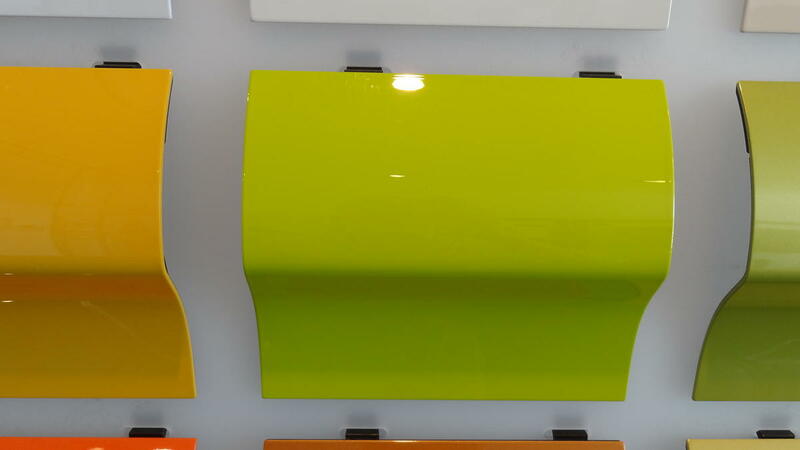 Personally, I have never seen a Porsche 981/991 destined for North America with all of these painted exterior trim options from factory. Has any of you here in this forum been successful in getting 'Porsche Exclusive' to approve these options on your 981? Amazing I love the details. The wheels are nicely done too, as are the carbon buckets with inserts. Wow. Fantastic. Thanks for posting this. Very interesting with the black and blue theme, inside and out. What amazes me is Porsche's stubbornness regarding brake caliper color. Yes, I get that they want it to represent a trim level or PCCB. But to me, so many of these PTS colors just don't look right with either red or yellow involved with the theme. I hate the aesthetic of yellow calipers (unless the car is the same shade of yellow, but I am not a fan of yellow cars, either) and I will never order PCCB because of it, and red is so played out. Give us the option of black - easy to keep clean, and goes with everything - or PTS on the calipers, too. Plenty of other brands do it, so it isn't a supplier issue. 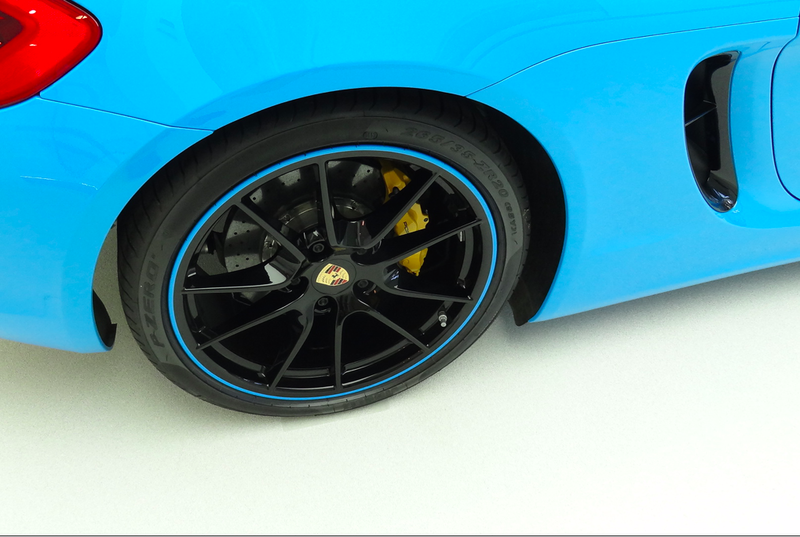 "When I visited 'Porsche Exclusive' at Zuffenhausen last year they specifically mentioned that several customers had requested a different color on their brake calipers from factory. The issue had been debated internally & a decision was made NOT to allow it. Seems to me that 'branding' has something to do with it. They wanted the calipers' colors associated with a particular 'spec' of brakes rather than a design element to be customized in a deviating color at will. So at Porsche, PCCB brakes are 'Yellow', S/Turbo/gt3 are 'Red' & Base are 'Black'! 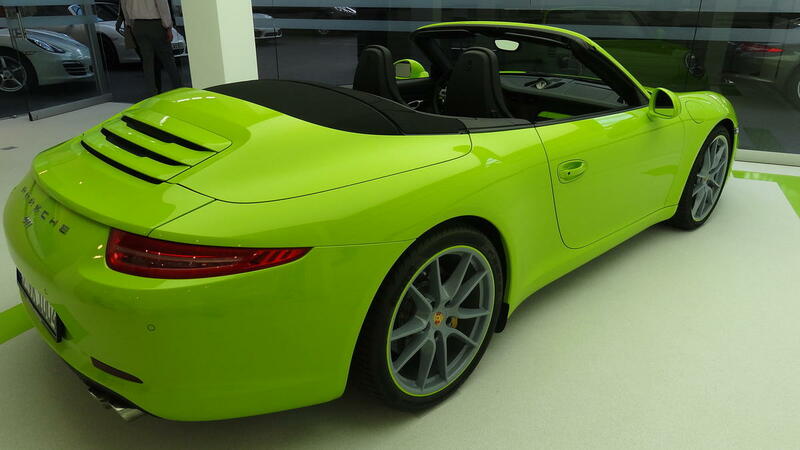 Except for the Cayenne/Macan (whose 'S' models - including the Cayenne Hybrid - inexplicably get 'silver' calipers ), Porsche Hybrids now merit their own politically correct caliper color - 'Acid Green'! So even if you custom order a $845K+ 918 Spyder with an expensive exterior PTS color which is in visual conflict with the standard 'Acid Green' brake calipers, you are s*** out of luck! 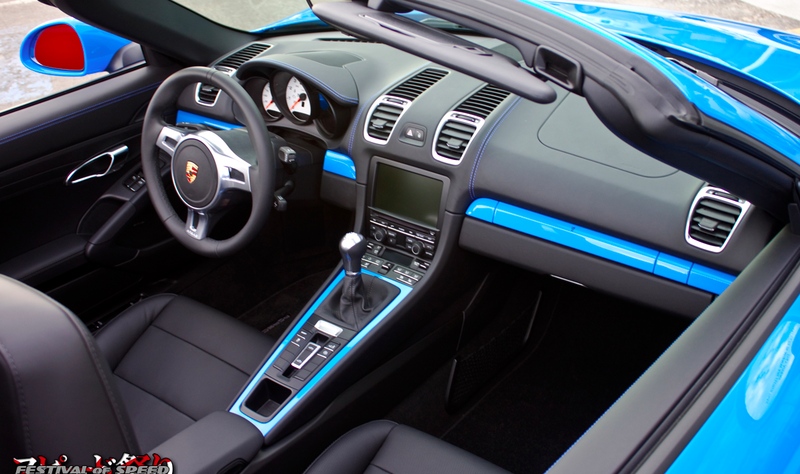 Of course, this can be customized easily & inexpensively once you take delivery of your Porsche." The attached PCNA issued Approved PTS List is dated 1/23/2014. Please let me know if anyone at this forum has a PTS list more current than this one so that our members know the latest approved list of Paint to Sample Colors available to them! PS I thank Dr. Bill/RayDBonz for this latest list. What seats are those? They look like gt2?